As you read this your brain is telling a story for you. Namely your story about you. If your brain is a healthy one you are the protagonist in this story. Your own personal hero. What if you can help your hero on the way? Let’s find out how you can help your hero along and use storytelling power to change the world. Many believe the brain separates fiction from reality. In “reality” the brains stores everything as stories. Humans are creatures of Neverland. We live in Neverland because we can’t not live in Neverland. Why does we like storytelling so much? It’s because our brain runs on stories. Our brain is basically a pattern recognition machine. It likes patterns. And stories are just very big complex meta patterns that our brain can identify and relate to. Our universe does not contain any Narrativium like Terry Pratchett’s Discworld but we humans acts as if it does all the time. That everything that happens for a reason and everything has a purpose and a destiny. This is what makes us humans so special and this is something we should treasure. Most of us believe our memory is filled with reliable info we can access at will. Not so. But memory isn’t an outright fiction. It is merely a fictionalization of what took place. Memory is an unreliable self-serving historian. It’s there to help us make decisions that help us along for the bumpy ride that reality is. This captures in a great way how our brain works and how we live our life inside our own little Matrix. Experiences and expectations are all part of our perception of the past and the future. Our place in the story we are telling about our self. Storytelling has been around for as long as we have been humans. And it’s the storytelling itself that first made us into the storytelling chimpanzee we are today. You must embrace fiction. It will make you more empathetic and more able to navigate life’s problems and dilemmas. Fiction pulls us together and unites us with common values. It’s the core that makes us into a groupish vehicle for our genes to pass down to our offspring as I discussed in my previous blog The Duality of Man [Can we work together?]. We use them to set a shared Moral Matrix for the group. As result of how successful stories have made us, we are also slaves under them. And they can easily be used to manipulate and mold us. If you want to burrow a message into a human mind. Work it into a story. But if we use the power of story for good, we can use it to change the world to the better. But you must also use caution when confronted with stories and the “Truth” that many will want to tell you. As you know by now, the truth can never be told but a mere “Truthy Tale” of what happened in the past. Many will believe that their opinions are facts, when they are just that: Opinions. This also means that we should be tolerant of the myths of all the cultures in the worlds as the bearers of these myths, are most certainly under the spell. Be vary of conspiracy theories as they are often the fiction of a storytelling mind who find patterns all to easily. The truth is depressing: We are going to die. We are tiny insignificant dots on a tiny planet in a tiny galaxy. We need self-deception to keep depression at bay. We are Figments of our own imagination. Until the day we die we are living the story of our lives. This story is constantly changing and evolving. It’s being edited and rewritten by an unreliable narrator and this story are more truthy than true. Enjoy it while it last and make it a good one! Now that you know more of the power of storytelling, will you stop loving stories so much? No, on the contrary, you will be able see life for what it is and enjoy good storytelling even more. Day dream often! You and I are going to tell a greater story together how life on planet Earth will be in the Future! 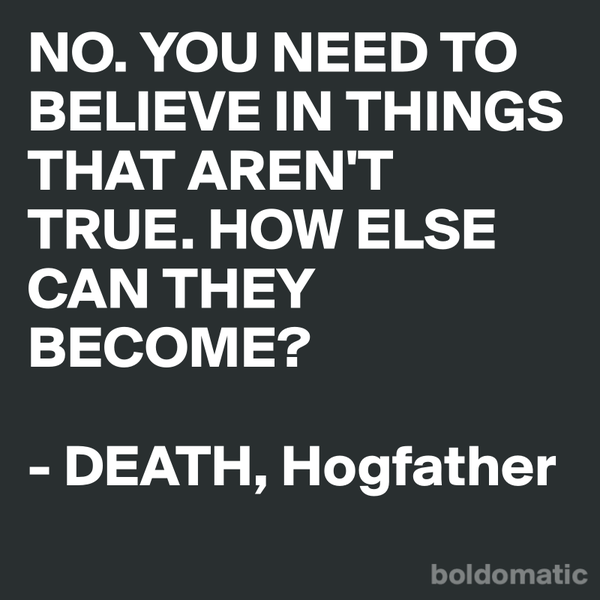 This entry was posted in Storytelling and tagged Hogfather, Jonathan Gottschall, Revenge, Storytelling, Terry Pratchett. Bookmark the permalink.